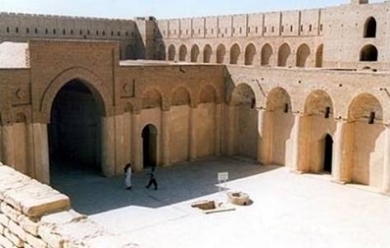 About 100 miles south-west of Baghdad is Ukhaidar palace, one of the most preserved palaces of the Muslim world. It is unique in its architectural wealth and incorporated some of the key innovations that greatly impacted the development of Muslim as well as non-Muslim architecture. Figure 1. The main gate showing its Pishtaq form, probably the first use in Islam. Lying in the desert about 100 miles south-west of Baghdad is Ukhaidir palace, one of the best-preserved palaces of the Muslim world. The palace is unique in its architectural wealth that incorporated some of the key innovations that greatly impacted the development of Muslim as well as non-Muslim architecture. Because of this, the palace has attracted much academic interest, particularly from German, French and British archaeologists and architects. However, these numerous studies failed to provide a proper explanation for the circumstances surrounding the foundation of the palace due to the absence of any text or in situ inscription to help establish a definite date and a conclusive story. Based on architectural evidence, researchers put the date of the construction of the palace at between 720 and 800 CE . This 80 year period provokes a serious historical problem, since within this period the Umayyad dynasty gave way to the Abbasids who gained power in year 750 CE. These events raise questions as to whether the Palace is Umayyad or Abbasid. 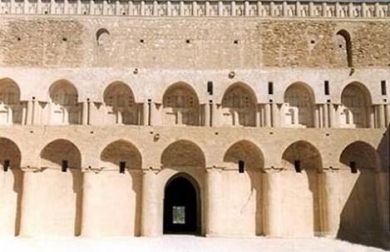 First, there are indications, which suggest that the palace is Umayyad, built before 750 CE. Features such as the presence of few semi-circular arches, the limited use of squinches to half-domes, the use of corner slabs to support the scalloped dome are all indices pointing out to the Umayyads whose architecture continued to use these elements before the architectural revolution of the Abbasids introduced the pointed arch, the expansion of the use of dome squinches and many other features. The Umayyads also had the habit of living in desert palaces. But who could have built Ukhaidir during these troubled times when the Umayyad were waging wars against the Kharijit and the Abbasids? Additionally, most princes and wealthy Umayyads had known residences. Figure 2. The fluted dome supported on triangular slabs bridging the corner of the square is an early version of erecting domes on a square bay. Similarly, early Abbasid rulers can be ruled out as Al-Saffah, the founder of the dynasty, for example, lived in his palace beside the Persian city of Anbar (about 45 miles west of Baghdad) and died there in 754. His successor Al-Mansur at first lived in his palace between Kufa and the old Persian town of Hira, and later settled in his capital Baghdad . This leaves us with two remaining theories. Creswell's theory proposes that the construction was due to the nephew of Al-Mansur, Isa ibn Musa (d. 783/4), who received large sums of money from the Caliph to prevent him making a claim to the throne. Isa was somehow promised the Caliphate after Al-Mansur who later changed his mind in favour of his son Al-Mahdi. Isa was expelled from his governorship of Kufa in 778 and was made to renounce his claim to the Caliphate. It is reported that on his expulsion he returned to his estates and used to visit Kufa every Friday for the congregational prayer . However, some scholars raised doubts about this thesis arguing that the two way journey of 200 km from Ukhaidir to Kufa through the desert could not have been an easy undertaking for a man who is known to have been a permanent invalid . The final possible patron of Ukhaidir suggested was Isa Ibn Ali ibn Abdullah, another nephew of Caliph Al-Mansur. According to the Arab historian Yaqut, Isa Ibn Ali built a palace named Qasr al- Muqatil on the site of a ruined pre-Islamic castle. Al-Muqatil palace was located on the road between Kufa and Al-Anbar, a location which is sufficiently close to Ukhaidir . "Here then we have direct evidence for a palace with the qualifications we are looking for: the timing is correct, and a man of such importance must have had the resources and what he hadn't, he made up for by employing building material for the most part already laid out for him" . The palace consists of two fortified enclosures. On the outer enclosure there is a 17 meters high robust rampart made from limestone slabs and mortar strengthened by corner and intermediary towers alternating with pairs of blind arches on pilasters. A series of portcullises were fitted along it and even on the supporting towers. These defensive arrangements, which must have added extra protection, were known to the Romans but this was perhaps their first use in Islam. Another defensive scheme employed in Ukhaidir was the use of arrow- slits, which were served by the wall walk (once vaulted). From these slits defenders of the palace could fire their arrows without being exposed to the enemy. The gateways were also fitted with slits in their vaults for dropping flaming missiles, as well as lateral grooves for letting down the portcullis. The enclosure was pierced, in the centre of each side, with gateways flanked by quarter round towers. On the main gate, in the northern side of the wall, we find the earliest appearance of the arched portal, set within a rectangular frame rising above the walls (pishtaq) . This gateway leads into a pointed barrel-vaulted hall made of seven transverse arches. The vault incorporated slits defending the entrance from the room above. Through the entrance hall one progresses into a square chamber covered by a fluted dome, the first of its type in Iraq, borne across the corners on flat triangular slabs forming a bridge on the corners of the square . This is followed by a narrow corridor and a set of internal curtain walls protecting the palace proper. Following this corridor, towards the west, one reaches a larger open space extending the whole length of the palace. The existence of an annexe building in the centre of this court and the remains of feeding troughs raises the speculation that it was used for keeping horses and possibly horse riding activities. The palace complex consists of series of functional units; the great hall, a mosque, a court of honour, audience halls and four domestic compounds called Bayts. Continuing from the domed square room there is the great hall. It is a large pointed barrel-vaulted hall of 7 meters width, 15.5 meters length and 10.5 meters height, with arched recesses to the left and right leading to side chambers which were probably store rooms. 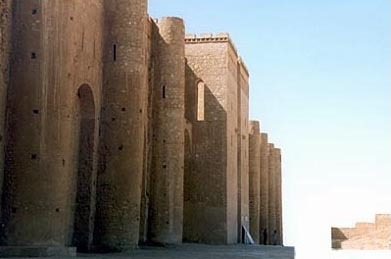 West of the great hall and to the right of the main entrance, there is the palace mosque, a hall consisting of a single aisle of five arches raised on cylindrical piers made of limestone and mortar. Above the arcade was a single barrel vault which had a corrugated surface, and along the ridge were coffers of diverse shape. The ends of the vaults were fused to the side walls by means of fluted half-domes with squinches of the same form inserted at the transitions. 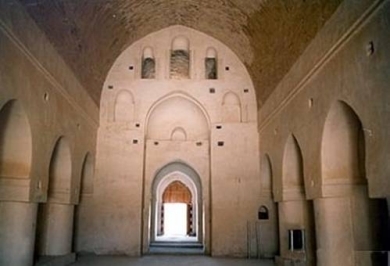 The architects and masons of Ukhaidir introduced, for the first time, an elaborate technique based on the construction of elliptical (pointed) barrel vaults with bricks in similar technique to building a wall which therefore made the way vaults were built considerably easier. The old tradition consisted of the use of a mixture of mortar, small stones and debris laid out on wooden base. Such method required a lot of wood not available in this arid region and building took a considerable time to finish as masons had to wait for the vault to dry to move the scaffolding to another part of the building. This new technique, likely to have been introduced through Persian and Mesopotamian Muslims, provided a good solution to these problems. Further innovation appearing in the vault of the mosque was the use of decorated flat arches to support the vault, a technique which was later transformed into the so called rib vaulting which revolutionised vault construction. The centre of the palace is occupied by the court of honour, a large court decorated with blind arcades, incorporating in its top sections brick decoration of geometric patterns. The northern side of the court is a 6 metres high wall arcades on round engaged columns, above which a second storey block with blind pointed arches having cusped archivolts, and rising still further above a set-back wall crowned by a parapet frieze of recessed niches. The south side once incorporated a vaulted iwan framed by a rectangular frontispiece in the form of pishtaq. Behind it, there was a long chamber for private audience connecting with a square room fitted with four doors, one in the centre of each side; this must have been the throne room. 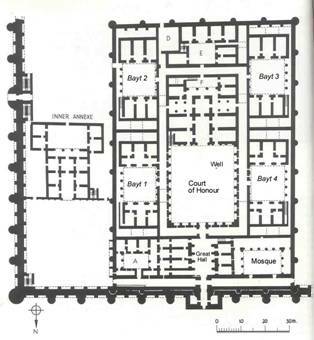 The four living compounds "Bayts" were self-contained units consisting of a courtyard flanked by two symmetrical built sections (north-south) containing three rooms each. They were distributed in pairs on the east and west sides of the court of honour, but kept in isolation from its ceremonial function by a tunnel-vaulted corridor encircling both the court and the audience hall. In many respects, Ukhaidir has been regarded as an important workshop where many elements of what was to become known as Muslim architecture were elaborated and developed upon. Below is a summary of key developments introduced in Ukhaidir and their impact on Muslim and non-Muslim architecture. The first of these innovations is the transverse arch. The Ukhaidir example is definitely the first recorded example of its Muslim use. Through Muslim examples, this type of arch reached Europe where it was used over the aisles in Romanesque architecture. These were semicircular arches thrown from each pier of the arcade to the wall of the aisle in similar fashion to that of the Mosque. To support the connecting point, at which the arch sprung from the pier, a flat pilaster was added to the pier. Later these transverse arches were thrown over the nave, providing greater safety and durability. The first recorded example is found in the church of St. Felice e Fortunato at Vicenza (985 CE). In a later stage the transverse arch represented a fundamental structural step in the process of development of the Gothic style. It led to the adoption of ribbed vaulting which progressively enabled the vaulting of the nave and the evolution of the compound pier. The form of the pier abandoned the single or cylindrical shape and became compound with an engaged member carrying up to the spring of the transverse arch. The second feature is the use of pointed arches and vaults. Such forms were to dominate much of the architecture of the Abbasids and later periods. More importantly, their introduction into Europe caused a revolution in the way buildings were constructed there. The semi-circular arcading and vaulting provided some static problems in covering large and irregular spaces. The pointed arch resolved the difficulty of achieving level crowns in the arches of the vault, allowing the vault to become suitable for any ground plan . The pointed arch did not reach Europe until late 11th century where it was first employed in Monte Cassino (1080) . Later, the pointed arch and vault were the corner stones for the development of the famous Gothic style of architecture. The vaulting system of Ukhaidir is also revealing. The use of the transverse arches and groin vaults which occur eight times in the Palace, sometimes as supporting arches, showed that Muslims were innovators in vaulting techniques. The vaults of the main hall of the palace and its mosque provide evidence of the early Muslim use of the so called rib vaulting. This initial technique later matured in the Ribat of Sussa (821-822) . Great Romanesque and Gothic cathedrals would not have been constructed the way we admire today if it was not for the introduction of rib vaulting. In addition to the above, one can mention elements of defensive architecture that were later to play an important role in the construction of Muslim and non-Muslim military architecture. The introduction of loopholes (arrow -slits), which were used to allow bowmen (standing or kneeling) to fire their arrows, left their influence on later Muslim fortifications. Europe did not realise their potential until 12th century when they were introduced by returning Crusaders. They first appeared in London in 1130 . The use of a portcullis is another defensive element that became popular across Muslim defensive structures and again appears in Europe after the Crusades. Finally we may note that the masons of Ukhaidir made a daring innovation which was to have a permanent consequence in Islamic architecture. The decoration of a top section of blind arches of the Court of Honour, which was based on laying the bricks in mosaic manner upright and sideways to form patterns, developed into a technique spreading across the Muslim world especially Persia where it became known as hazarbaf, or "thousand twistings". Creswell, K.A.C. (1989), ‘A Short Account of Early Muslim Architecture', Revised and supplemented by James, W. Allan, Scolar Press, p.261. Jairazbhoy, R.A. (1972), ‘An Outline of Islamic Architecture', Asia Publishing House, Bombay, London and New York, p.55. Creswell K.A.C. (1958), ‘A short account of early Muslim Architecture', Penguin Books, pp.201-3. Jairazbhoy, R.A. (1972) op cit., p.55. Also called cataracta are usually suspended by iron rings to be dropped behind the enemy imprisoning him. Michell, M. et al. (eds.) (1978), ‘Architecture of the Islamic World', Thames and Hudson, London, p.
 Jairazbhoy, R.A. (1972), op, cit, p.58. Symbolically the pointed arch embraced the divine dominance of the ordinary arch/ dome but the upward stilting pointed to the divine sky. Christians used it for this symbolism too, and in some cases it was combined with lobed arches to signify the theme of the Trinity. 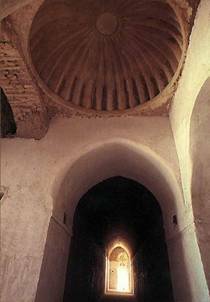 See our articles: Architecture under Abbasid Patronage (750-892) & The Pointed Arch. 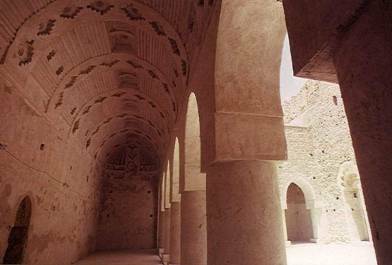 See our article on Ribat of Soussa, Muslim invention of rib vaulting? Jairazbhoy, R.A. (1972), op, cit., p.58.